Oh Avocado! If you love the fatty, creamy, and sensual fruit as much as I do, you'll love these vegan desserts where avocado takes center stage. Try one recipe tonight for dairy-free deliciousness*! Last week, I made vegan avocado ice cream using a recipe I found in Whole Foods Market magazine (North Atlantic Spring 2014 edition; page 22). The ice cream has 5 ingredients: avocado, coconut milk, almond milk, sugar, and vanilla extract. I just blended everything in my Vitamix, chilled it, then put it in the ice cream maker. It was my first time trying avocado ice cream and it was incredibly delicious and simple!!! 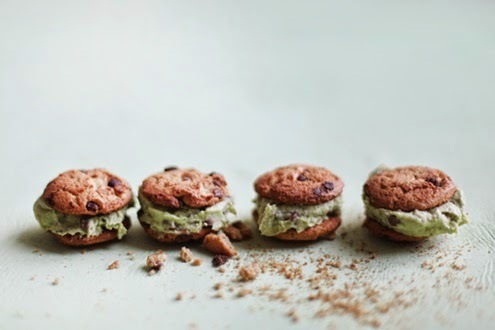 I hope to try this recipe for vegan avocado mint chip ice cream that I found via Free People blog soon. I'm kinda miffed that there is no recipe for the cookies that they made yummy looking ice cream sandwiches with. Fortunately, I found this chewy vegan chocolate chip cookie recipe which claims to be "great for ice cream sandwiches." I've been wanting to make this for months. Maybe someday I'll have a craving for chocolate pudding and have a ripe avocado in the house. Maybe today is the day for you. Here's a vegan avocado chocolate pudding recipe from Rachel at Girl Meets Nourishment blog. I'm too lazy to make this. My fancy cake baking days are over. However, if you wanna bring a cake to my birthday party, I'll love you forever if you bring this strange dessert: vegan chocolate cake with avocado butter cream via Joy the Baker. *Yes, these desserts have lots of sugar so even though they are made with fruit, they are still sometimes foods. I love sometimes foods! Do you have an unusual way to enjoy avocados?